Guerlain is marketing Guerlain Homme as a new type of fragrance — a new type of ‘freshness’ in perfumery; Wasser calls it “inimitable”. The Guerlain Homme film ad is set in a jungle, where a well-groomed, half-naked, modern-day ‘Tarzan’ drinks at a watering hole alongside wild animals. I like the goofy ad but there is nothing really new, wild or animalic about Guerlain Homme. As I wear Guerlain Homme, I don’t think “Tarzan” or “jungle” — I imagine a Lacoste-clad guy on a Caribbean veranda sipping a mojito alongside Delacourte. But just because Guerlain Homme is not wild, or wildly original, does not mean it’s bad; in fact, this is the first new mainstream Guerlain fragrance I’ve liked in a long time (excepting a few of the Aqua Allegoria fragrances). Guerlain Homme contains bergamot, lime, pelargonium, green tea, mint, rhubarb, vetiver, cedar, rum, and sugar cane. Guerlain Homme opens “fresh”, with vibrant rum, followed by a sweet-sour lime note, mint and citrus. As the scent develops, I also smell crisp green tea and a tart-fruity note (the rhubarb?) One of the most interesting notes in Guerlain Homme smells like dark brown sugar. Guerlain Homme goes from bright, fresh “alcoholic” notes to warm, soft ones; it wears down to a vetiver and barely there cedar accord that retains a hint of lime — not fresh pulpy lime, but powdery lime (the lime-powder element in Guerlain Homme reminds me of the dearly departed Floris London Limes talcum powder I used to wear during hot L.A. summers). I love the lime in Guerlain Homme, and lovers of Guerlain fragrances will notice a Guerlain vibe in Guerlain Homme’s base notes and dry-down. The most interesting notes and accords in Guerlain Homme are best savored up close after a light application of the fragrance (three sprays were all I needed to scent my skin for over 10 hours). Guerlain Homme’s fresh-warm character makes it a good year-round fragrance and it’s the perfect scent to wear when you want to smell good, but don’t want to make a “statement” with your cologne (and that’s not a polite way of saying it’s boring either — I like Guerlain Homme). Guerlain Homme wears like an Eau de Parfum and has excellent sillage. During the Guerlain Homme website interview, after Delacourte’s Cuba-mojito connection is presented and Wasser claims to have worked on the mojito accord of Guerlain Homme on his own, Delacourte abruptly calls a halt to all such discussion and does what she is hired to do — returns the focus to her company; as the musical score pulsates, she says dramatically: “We are going to create a Guerlain perfume….” But where’s the Guerlain in Guerlain these days? Jean Paul Guerlain chose Wasser as his successor and in homage to his fellow perfumer, Wasser added vetiver to Guerlain Homme as “a nod to Jean Paul Guerlain and his first ever perfume, Vetiver”. Jean Paul Guerlain, though ‘retired,’ was unable to resist adding a little something to Guerlain Homme as well; he suggested including the rhubarb note to prolong and echo Guerlain Homme’s fresh opening accord — a pleasing coda to Guerlain Homme’s creation. Guerlain Homme is available in 30, 50 and 80 ml Eau de Toilette and in matching grooming products. 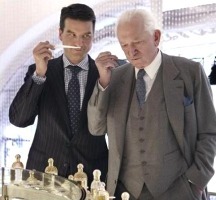 Note: image of Thierry Wasser and Jean Paul Guerlain via guerlainhomme. Hmm guess I'll have to try this again and see if I like it any more this time. eminere: If at first you don't succumb…. 3 Sprays? 10 Hours? AND he likes it too! Gotta go sniff this one. Hope all is well K, and thanks for another enjoyable read. For some reason, I am not able to ever get to the interview part of the website. When will big perfume companies finally learn / know better than to construct their whole website on Flash??! While the ad is quite good and must have been very labour- intensive filming each animal by itself, it has nothing to do with the fragrance. Some women (and men!) will find the model quite yummy, I'm sure. A smoky steamy bar in Cuba would have been a more apropo setting. The same model, drinking a mojito and smoking a cigarillo, leans against the bar as a major babe sidles up to him. They could then be seen frolicking in a pool with a waterfall surrounded by lime trees. “For the animal in you” works for the ad but not for the fragrance's character. Full marks for the juice and the fabulous bottle, although it is sligthly reminiscent of Dior Homme's bottle. As a fan of fresh ozonics, this fragrance really does it for me. The name is okay but unimaginative. Derby, Habit Rouge, Heritage, Coriolan: now those are great men's fragrance names. C: the lasting power amazed me…I'm predicting you will like it too…. Ayala: the opening section takes awhle to load even with high-speed Internet. You can bypass it by clicking the button at the far lower right of your screen. Then hit “Fragrance” on the lower left and you will get the “Interview” option. Ayala, adding that I couldn't do anything at that website in Firefox, but had better luck in Internet Explorer. Even in IE, it eventually froze up my computer, but did manage to watch several videos before that. Celestia: the ad does NOT relate to the perfume at all! And I hate the bottle (though the 30 ml size looks better to me…but where will I find it in the US?) Thankfully I didn't get any “ozone” in the mix…the freshness smelled natural to me. And you're right about the name…Bor-ring! Dusan: HA! But you know, I always give the Guerlains a chance…. I don't think Homme is ozonic; I'm just into fresh and aquatic fragrances. You'll have to come up to Canada to visit me to get Homme! Celestia: TRUE! Canadians always have the 30ml sizes…a big thanks to all Canadian retailers! Three sprays last ten hours? That defies belief! I'm curious even though I have more mint than I can handle with two Aqua Allegorias (Mentafollia & Herba Fresca). The composition of this sounds interesting, though, and I love rhubarb notes. How would you compare this to the “minty lemonade” of Fath's Green Water? I have to admit, as far as lime goes, I'm still much more eager to try Jo Malone's Sweet Lime & Cedar than Guerlain Homme, though I certainly need to sample both from the sound of it. Have a great weekend, Kevin. Kevin: Sephora has the 30 ml on line. Joe: To me, Guerlain Homme is much more interesting than the modern version of Green Water. And GH is more lime-y than minty…mint is a bit player. I need to sample Sweet Lime and Cedar too. Have a great weekend yourself…. I tried clicking on the French version, and it loaded immediately. It might be that the site has to convert & load the other languages and that's what takes so long? I tried this last weekend. Maybe I didn't apply enough, but the longevity was really short on my skin (four hours at the most). I thought it was pleasant and I think I enjoyed the sugar cane part the most, but it of course didn't last long. Honestly, I am enjoying the 'other' new mens fragrance w/ mint a little more: Roadster by Cartier. To my nose, Roadster smells more like a Guerlain (especially at the drydown) than GH does. Stupidly, I thought the entire bottle was wrapped in metal – but not so. Only the 'face plate' is metal – the sides and back are clear glass. Mike: Roadster does have a more oriental/”classic” Guerlain-like drydown: the VANILLA. 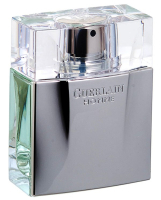 I was happy Guerlain Homme wasn't vanillic…GH's put Roadster in my 2nd place slot (SO FAR) and taken over as no. 1 of the new mainstream men's releases. Alas, there are still lots to sample. I understand it is beautiful and classic, but it does nothing for me on first impression. I will try it on skin and give it another chance. Thank you Kevin for another fun and great review! KG: it fits perfectly into a niche in my perfume cabinet that just became vacant: the spot Guerlain Vetiver has (my bottle just ran out)…something that's multipurpose, fresh, but with some depth in the dry down. So happy they make a 30ml! My husband loves it. I haven't worn it yet myself, but I really ought to go smell him, because this is the first fragrancehe's been enthusiastic about in a long time. Dear Kevin: We do seem to get our wires crossed. We have Homme in Canada but only in 50 and 80 ml sizes. There's shower gel and deodorant stick. Since the 30 ml has no silver on the face, would you like the bottle better? bartamy: yes, you ought to go have a sniff…do you have veto power? HA! Celestia: too bad…I've always had good luck finding 30mls in Canada. And, yes, I like the bottle better without the metal on it. OK tried it again today on skin and nope, still don't like it. It just smells really, really sour on me. Must be the mojito accord going off on my skin. When this just came out I was at House of Fraser and was walking along the Guerlain counter with my box of krispy kreme (which seemed to attract more attention than anything else) and started chatting with the SA about how I loved Vetiver and Samsara, etc. So SA decided to give me a couple of samples of this (yes, they really pick who they give samples to and not just give them away..) Anyway, when I got home and tried it on I thought it was insipid. I dont know if I was perhaps expecting a lot from Guerlain but this just smelled plain, boring and generic to me. I wasn't looking for a statement but something that would make me go “ooh that smells nice” and this wasn't it. Disappointed..
oh and what's with that TV ad? hmmm, I did not like it so much because of the strong Mojito touch, like a drunk guy coming far too close to me. And the press release in german was awful(ly funny). They talked about “the wild animal”, that is barely tamed etc. The text was only emabrassing and distracted from the scent. I liked the mint in it only, but then it turns to mainstream for me. There has been much debate about Gurerlain Homme on BN with a great many coming out against it. I am not in that number. I tried this fragrance a couple of months ago and was impressed. It's not a headline-grabbing fragrance, I do accept, but what it does, it does very well indeed. It does have a fresh and limey feel to it in the opening, but unlike most of the other “fresh” fragrances out there, this evolves and evolves and evolves but very slowly – and that's the clue as to the depth of parfumer's art which is behind this fragrance. And it really is quality juice – I am with Kevin on the longevity too with it not only retaining great sillage but it lasts for EdP lengths of time on my skin. It's greatest sin is not being spectacular enough. It doesn't have the heady rush of Habit Rouge or the peppery blast of Vetiver. It's too modest in the opening, at that's why I think many have dismissed it as a mainstream fragrance. Yes, it does share it's opening with many other High St fragrances, but what it does after that is what none of your CKs or Boss fragrances do and that is develop properly through head, heart and basenotes. I will be buying this and I think in time this rather ugly and unloved enfant terrible will be loved and regarded as a modern classic. I like this. The listed notes are present and correct (to me) and they smell good together. You're right it isn't groundbreaking but it is a quality scent and I'd be very happy to smell it wafting around (love a good mojito!). Thanks Kevin! 1) The model looks like he could be Thierry Wasser's adolescent son (the eyes). Coincidence? 3) I don't know about that bottle, the cap looks so much like the latest “Boss” from Procter and Gamble! What a turn-off. Please tell me that it's better looking in person. Eric: HA! The bottle looks bad in person too (if I'm not mistaken the 30ml bottle is nicer and does not have the ugly and meaningless metal front); I'm judging by the photo gallery at http://www.guerlainhomme.com. One thing I do dislike about it is the price by the way, which even in discount perfume shops like The Perfume Shop it's like £38.99, for the 50ml. Come on, when you can get Guerlain Habit Rouge for way less than that or Guerlain Vetiver, there has to be a degree of realism in the price point. Following reading Kevin's review I tried it on again in The Perfume Shop and that was mid afternoon, it is now about six hours later and the fragrance is still strong on my forearm where I sprayed it. My earlier recollection of the fragrance remains true, it has evolved into a very pleasing and long-lasting fragrance – in a manner far exceeding that of more common-place fare. Use Google Chrome – I've been using it for a couple of months now and it's the best browser out there and way quicker than anything else – including Firefox and IMO, Safari. HDS1963: I bet over the next 6-8 months the price will fall a bit at discounters. Maybe it's the discounters I shop at most, but it seems there's not much of a discount on the majority of Guerlain, Chanel and Hermes scents. Having bought a 50ml Guerlain EDP 3 or 4 years ago (that finished recently), i decided that i should go and buy another one. Yesterday i was on an airport duty free shop and sniffed the “new” Guerlain Homme Intense. It did not have the same smell not even the same metal plated dark glass. It was a dark glass with white painted letters. Possibly a reformulation. Accidentally in the travelers corner i found a set of Guerlain Homme EDT 80ml with Shower Gel at 65€. After a chat with the saleswoman and to her surprise, where in the shelf i found it, she confirmed that this specific package was there from 2011!!! Lucky me :). Of course i bought it and its the original before the reformulation， along with the metal plated glass.